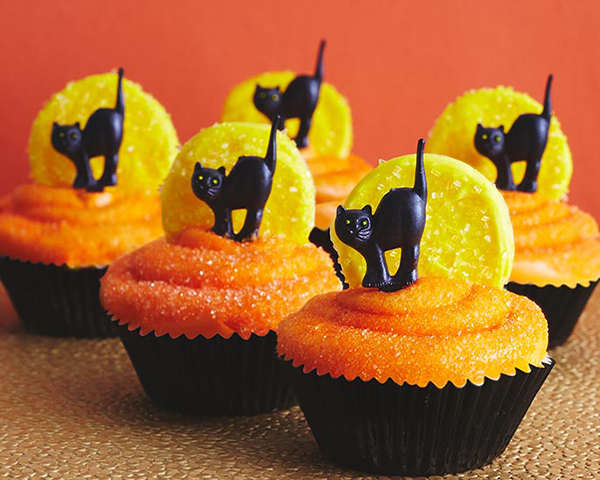 Black Cat Cupcakes! 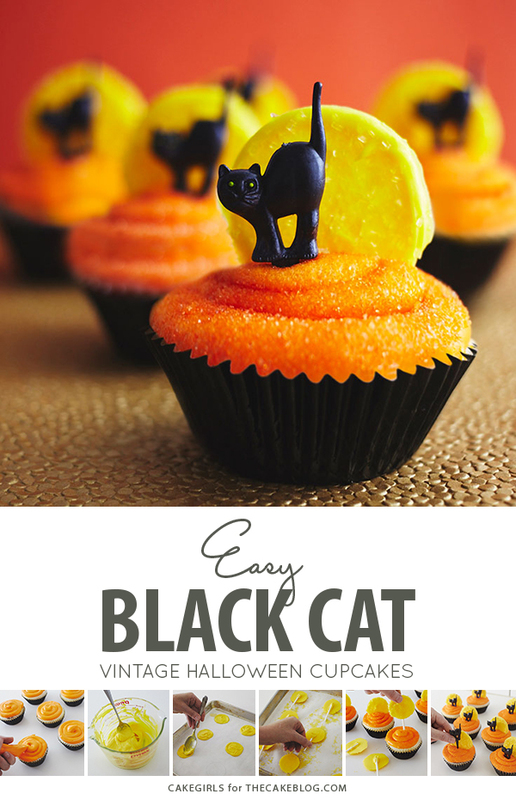 Learn how to make these easy black cat Halloween cupcakes with a simple step-by-step tutorial by our contributors, Mary and Brenda Maher of Cakegirls. We love Halloween. I mean, who doesn’t. 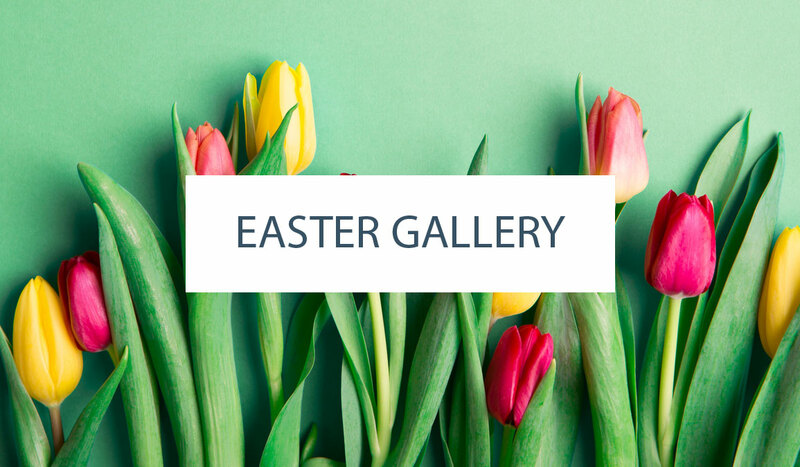 If you’re a creative type, this is your time to shine. Homemade costumes, artful pumpkin carving and handmade sweet treats. 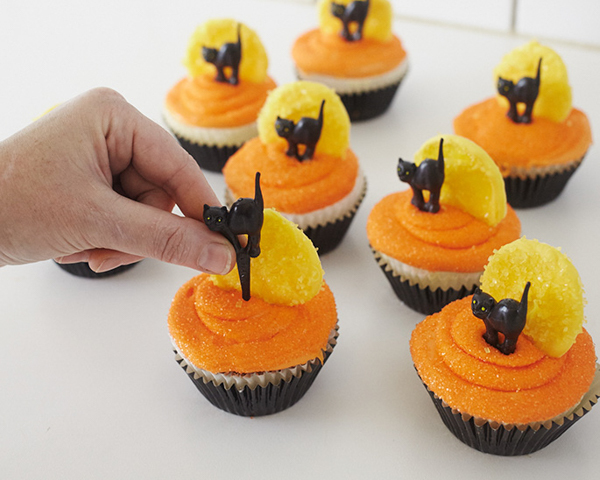 So there’s no chance you won’t let these spooky little black cat cupcakes cross your path. The kiddies will love them, they’re easy to make and they definitely say spooky in a “Vintage Halloween” kind of way. 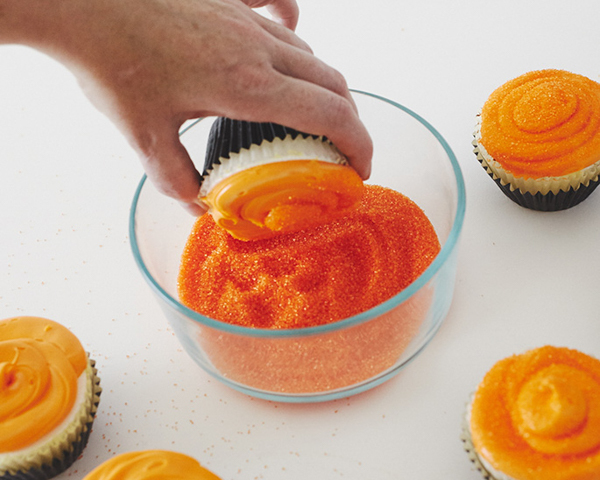 They start with homemade cupcakes, in fact we love these Classic Pumpkin Cupcakes, with the frosting tinted orange of course. Then the fun begins. The sparkly moon backdrop is as simple as melted candy coating sprinkled with sanding sugar and supported with a simple sucker stick. We add more texture to the cupcake surface with some additional sparkly sugar and then add a vintage novelty cat pick to finish it off. These look straight out of the 50’s but with a simple and modern Halloween vibe. 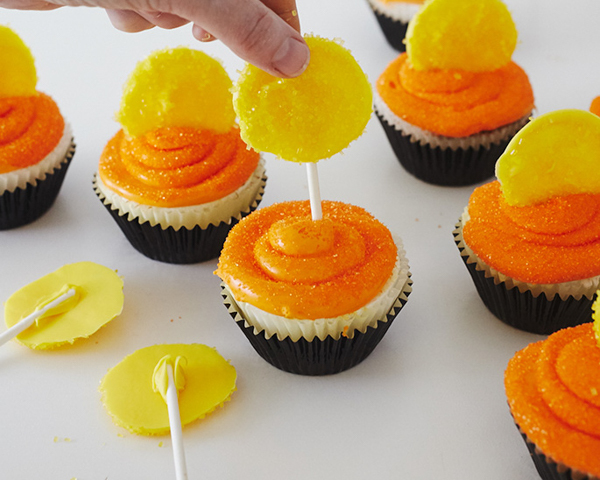 They’re the perfect crowd pleaser at your next Monster Mash. 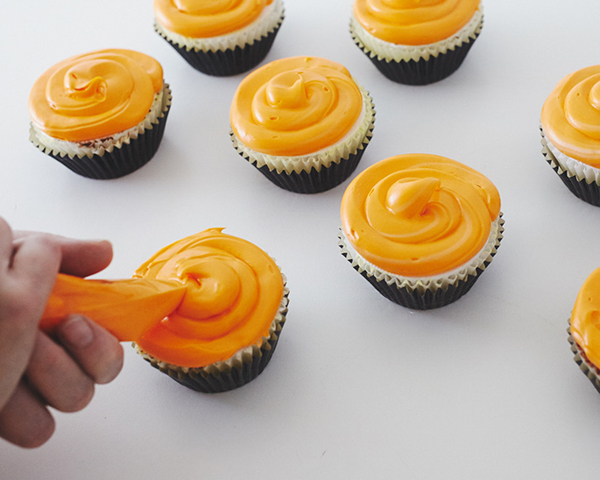 Start by piping orange icing on the cupcakes. 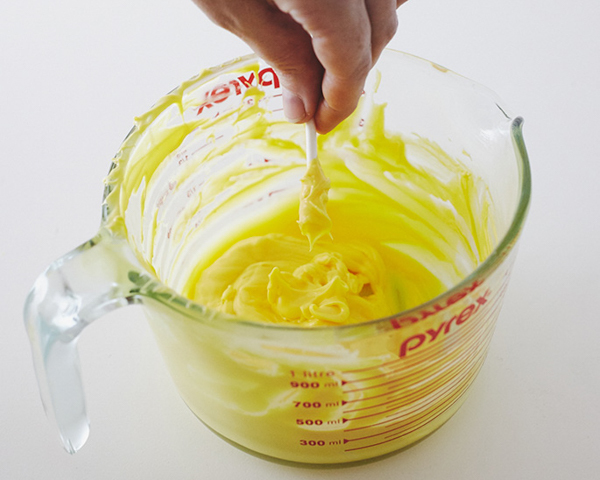 If you don’t have a piping bag, you can fill a ziplock bag and snip off the corner. Or you can just frost them with a spatula instead. 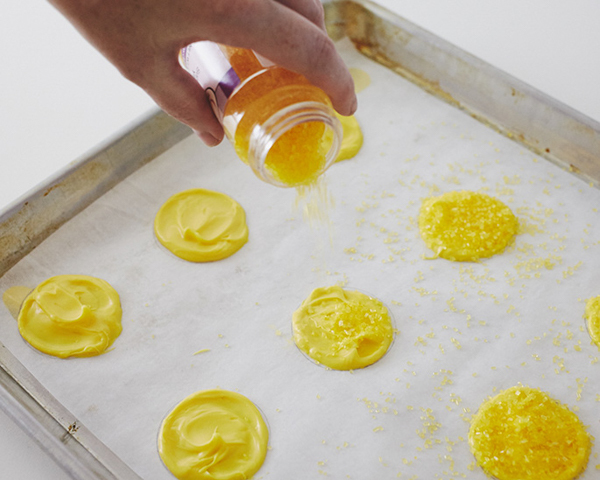 Sprinkle or dip them to coat with orange sanding sugar. Place them in the fridge while you create the moons. 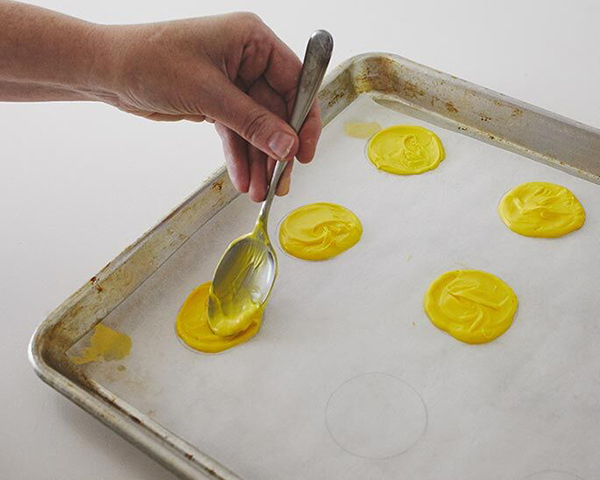 Place some yellow candy coating in a microwave safe bowl and heat on 1/2 power. Remove every 30 seconds and stir. Continue to do this until the coating is thoroughly melted, but be sure to avoid overheating the coating or it could burn. Use a pencil to trace 2 1/4″ circles on a piece of parchment paper. Flip the piece over and line your tray (you will see the outline through the paper). 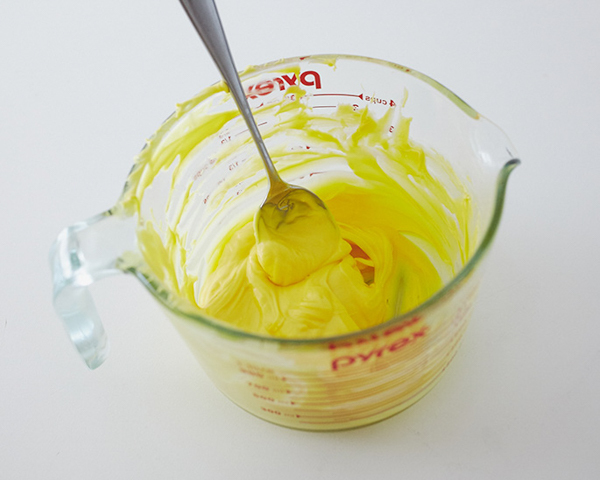 Use a spoon to dollop and spread the coating into the circles, but don’t make them more than 1/8″ thick so that they’re not too heavy for the top of the cupcakes. 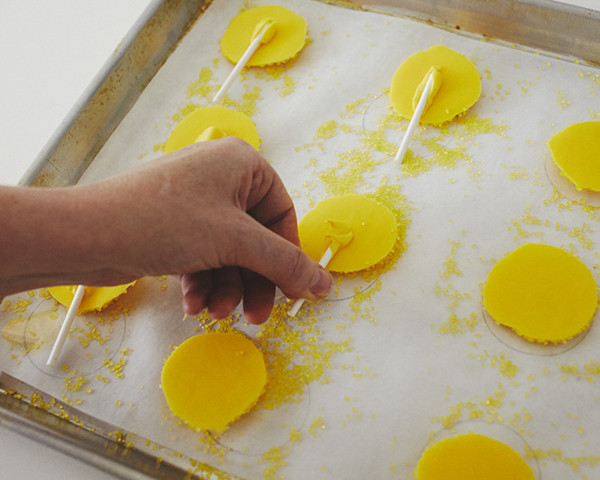 Immediately sprinkle the tops of the circles with yellow sugar crystals and place the tray in the fridge for 10 minutes, or until firm. Remove the tray from the fridge and flip the moons over. Measure your sucker sticks to make sure they aren’t too long to attach to the back of the moon and insert fully into the cupcake. Break off part of the sucker stick if necessary. Dip the stick in some melted coating and adhere to the back of the moons. Place them back in the fridge for 5 minutes until firm. Insert the moons into the chilled cupcakes, pushing the bottom edge of the moon down into the frosting. 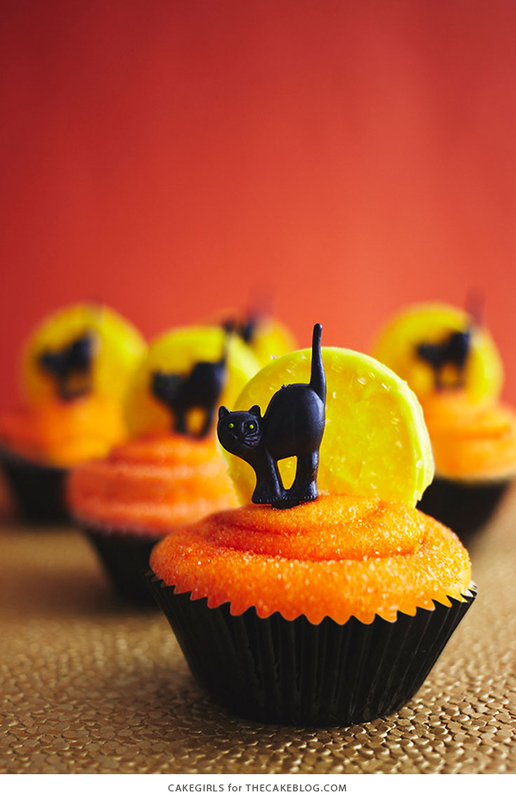 Place a black cat cupcake pick in front of each moon. Ohhh….so spooky! Waw. So nice, looking awesome. So artfully done and the end result is simply amazing! Great Job! It looks so adorable and yummy!!! where did you find the cat picks? 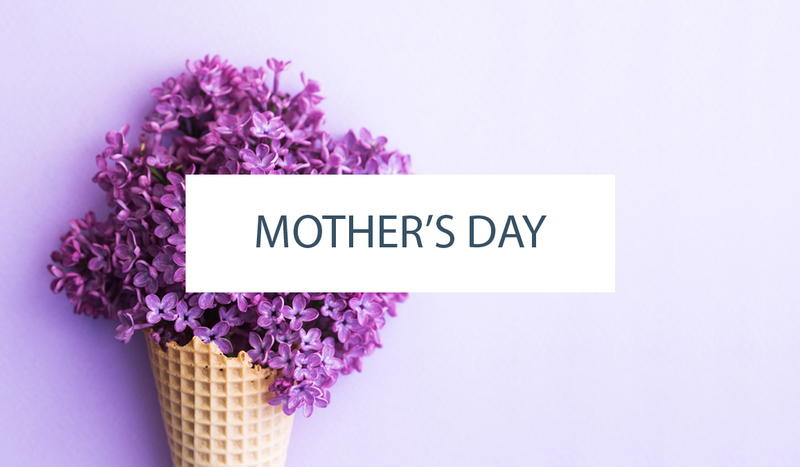 There’s a link in the supply list above – hope it helps!